Is it really already half way through November? Can't forget about my monthly giveaway for all of my lovely followers, now can we? Remember my 27 before 27 post? Well, number 23 on that list was to purge my craft supplies. It's time to pare it down a bit and focus on the things I really love and am good at. One thing I am really not good at: sewing. Especially complicated things. I can sew a line, and I can sew on a card. That's really about as much as I can handle. 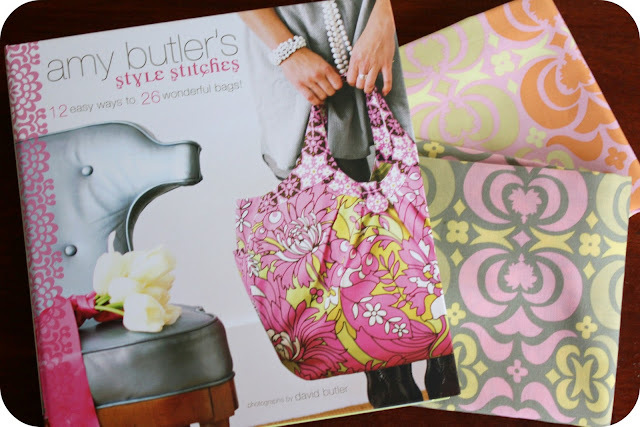 The book Style Stitches by Amy Butler as well as a yard of some lovely fabric of hers. (1/2 yard of each pictured). Just look at some of the beautiful projects in this book! 1. Mandatory entry: Be a follower of little lovelies. Leave a comment telling me so. 2. Bonus entry: Like little lovelies on facebook. Leave a separate comment telling me so. 3. Bonus entry: Follow little lovelies on twitter. Please make sure your email is linked to your profile or leave it in your comment(s). This giveaway is open to U.S. residents only (books are heavy to ship!) and will end on Friday, November 25th at 10:00pm CST. Thanks to all of you for being such lovely, supportive followers. Good luck! I love these kind of giveaways! great giveaway - thanks! I'm a follower! I like little lovelies on FB! 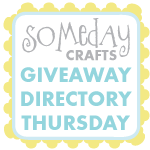 I follow Little Lovlies - I love your blog, what a great giveaway! I like Little Lovelies on facebook. I'm a follower on your blog! And I follow you on Facebook! And I've been wanting this book!!! just found your adorable blog... I am a follower! ... and now "liking" you on facebook. ... and following you on twitter! Yay! I love Amy Butler! I'm already a follower of Little Lovelies! I LOVE their stuff! I follow Little Lovelies in twitter. Already a follower of little lovelies blog!! Awesome giveaway! I'm already a follower of your blog (and I put a link on my blog as well). I'm now following you on Twitter as well. Best of luck everyone! Now following on Twitter. : ) I just recently discovered your blog. : ) Thanks for sharing your ideas! I thought I already was a follower to your blog, but I wasn't! It's so much more fun than just seeing you on fb! Love the Amy Butler giveaway items!! I'm sewing with my 8th grade class this month & it always increases my love of fabric & sewing when I do!!! I'm thinking my little white pup might benefit from some AB fabric if I'm the lucky one! I think I've been following you on fb since this past winter...? :-) not sure if my email is linked so it's karensarickfan@yahoo.com & that's my earlier post too! Awesome giveaway! I'm a follower! Awesome giveaway! I looooove Amy Butler! I'm a Twitter follower too! I'm a follower! I liked you facebook, too, which is where I found this amazing giveaway! I follow you! Thanks for the giveaway! Just gave you the thumbs up on Facebook! I follow you on facebook now, too! I'm a follower! :) Thanks for the chance! I follow on Twitter, too! Wonderful site. I love finding new sites and sewing. I have a couple of great ideas if that fabric makes it from your stash to mine. My sister in Hawaii would be thrilled with a gift from that fabric!! I'm now a follower on your blog. I also liked you on Facebook - how could I not?! I love being a followe of little lovelies! Oh I love Amy Butler! I am a follower! I follow little lovlies! thank you! I've also got a giveaway going on if you'd like to check it out! I'm totally subscribed to your blog! I'm totally liking your facebook page! I'm totally following you on Twitter! I am a blog follower. Love that green bag with the peacock tail-like appliqué. I follow on Twitter (jb_designs)! I Love everything "Amy Butler". I am now a follower. lovely giveaway. I am now following this blog. I also like you FB! I'm a follower on GFC (The Scrappy Housewife)! I follow little lovelies! Would love to win this book, I love Amy Butler! I'm following you on Twitter and I RT your giveaway! New follower here. Found you from a link on "one pretty thing" to your ornaments. Fun blog! I just signed up to follow! Would love to take these off your hands and put them to good use! I'm a follower! I'd love this book! I have enjoyed looking around and exctied about furture post! I've just become a follower and I'd love to join your contest. Thank you! I like Little Lovelies on facebook! I'm a pre-existing facebook fan as well. Well, I like anyone else would love to be able to put this book on my craft shelf (and take it down and use it, of course!). Thanks! I am a new follower via GFC. I am following via Twitter. I'm a follower! Great giveaway. I just found your blog yesterday and really enjoy everything about it! Thanks for this giveaway! I love Amy Butler & your blog :) I follow & I'm a fan :) Thx! Count me in! Love your 27 idea. My bday is less than 2 months away and I'm in my 40s, but I'll consider it for next year. I'm like totally following you on Twitter n' stuff. I just found your blog and I love it already! I'm sure this will be above my skill level as well, but I would love to give it a whirl! Thanks for the chance to win - I love Amy Butler! i'm a follower! 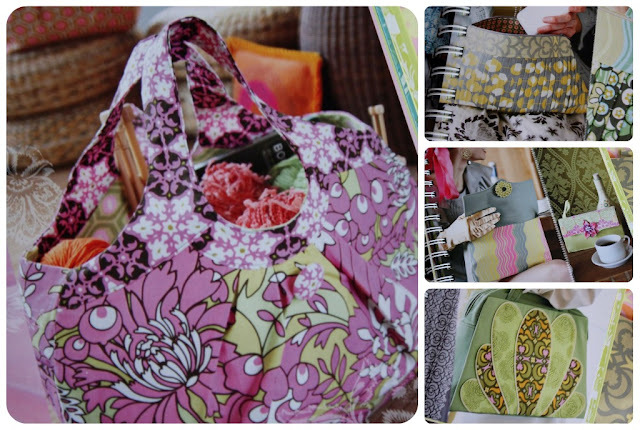 super fab giveaway! thanks! fantastic giveaway! I am a new follower of your blog. I'm now a follower on twitter! I am a happy new follower of Little Lovelies! I am now following Little Lovelies on Twitter!